Established in 1957, the mission of the Department of Fine Arts was “to promote the study of Chinese art and culture and the exchange of Chinese and Western art”. In its early years, the Department aimed to nurture artistic talents by offering a general programme with art theory, studio practice, literature, history and philosophy. In 1981, it set up a M. Phil. programme and in 1992, a Ph.D. in the History of Chinese Art. 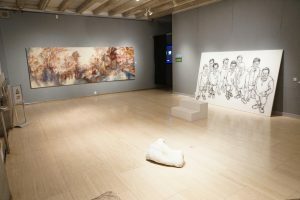 With the establishment of the M.F.A programme in 1993, the Department became the first tertiary institute in Hong Kong to offer a postgraduate programme in creative art. In 2009, the Department set up a part-time M.A. programme in Fine Arts with the aim of training more art professionals for Hong Kong.